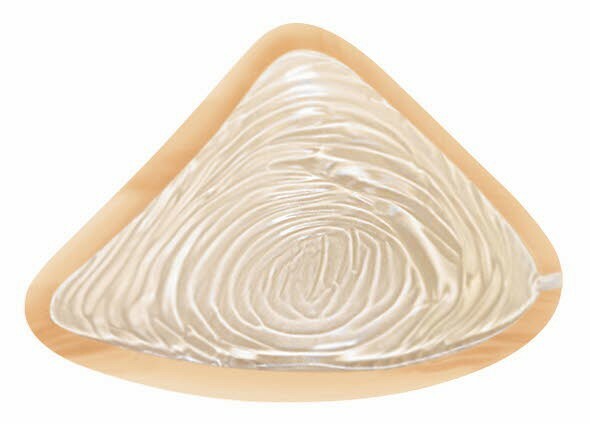 The Amoena Natura 2A Light Breast Form is breast prosthesis to restore a feminine silhouette, post breast surgery. The Natura 2A Light line of breast forms are made with soft, lightweight silicone that drapes softly, closely resembling the fall of a woman as own breast. It's even designed to flatten when a woman lies down. It's able to achieve this with a thin layer of Amoena's standard silicone over the cup side with a reduced weight, Intouch silicone on the inside. This lightweight form is a third lighter than other Amoena standard breast forms plus it has a super soft film for a silky touch. This gives huggable softness with a natural feel and look. In addition, the integrated Comfort+ patented technology allows for a long wear time. The technology works with the body's temperature and absorbs, stores and releases heat. The clear back gel layer is soft against the skin to not irritate scars and reduces perspiration to keep you comfortable. An average cup fitting is found with the Natura 2A. It also offers an asymmetrical shape for a left and right fitting. This shape has extra extension under the arm/axillar to fill in missing tissue or unevenness. The form can be placed directly against the chest wall or inserted in any of the Amoena mastectomy bras such as the Lara Non-Wired Soft Bra . The built-in bilateral pocket secures the breast form giving you confidence throughout your day. The forms come with a soft carrying case for storage. Amoena recommends daily cleaning of the form to ensure symmetry shapers remain in good condition. Breast forms, other than Amoena Contact, should be cleaned with a gentle soap, such as the Amoena Soft Cleanser and lukewarm water. The form can be dried with a soft cloth or towel. Place breast form in the cradle provided in the soft carrying case or breast form box. Always refer to the care instructions listed in the specific product packaging for full details. Caution: Do not use talcum powder and body lotions on or around the area where the breast form is placed.